Do I still hold grudges against people who picked on me in high school? Today I was watching a video on vlogbrothers where Hank Green talked about 15 of his favorite feelings. Each video is only four minutes so any one of his favorite feelings only would have lasted a little more 15 seconds on average. Near the end of his video, he said something that struck me. One thing that he didn’t find enjoyment in was watching people whom he thought were bad people for one reason or another (e.g., they’re jerks), seeing them suffer or fail at something didn’t bring him any joy. Whether they failed at something or succeeded at something, neither made him feel good. It was a paradoxical feeling to explain. A long time ago, maybe 20 years, I remember seeing an actress win an award for something. I can’t remember the actress or the awards show, but I remember what she said. She went up to deliver the acceptance speech and jokingly said “A long time ago, I used to think that if I ever won an award, I would get up here and name each of the girls who were mean to me in high school. But I’m not going to do that.” And she didn’t. And that statement has remained with me to this very day. I remember thinking at the time that if I ever got the chance to name-and-shame people who picked on me in high school and junior high, you’re darn right I would do it. That’s what I thought way back then and I never forgot it. I was picked on by someone every year from the time I was in Grade 7 up until my last year in Grade 12. And it was someone different each year (except one guy who did it in Grade 9 and then did it again in Grade 12). I never once did anything to instigate this because I always kept to myself, people just did it. And I hated them for it. Wait. Is “hate” too strong a word? I can’t actually remember how I felt but I’m pretty sure I would have hated them at the time. The question now is that if I got the chance to stand up at an awards ceremony like the Academy Awards, would I name-and-shame the people who picked on me? I don’t think it’s because I’ve gotten over it, though. It’s only because I know that it would reflect badly on me and that I am supposed to have gotten over it, and I want to avoid the social disapproval. I’m not sure if I have gotten over it or not. I don’t think about the people who did pick on me, I can only remember the names of 3. Hmm, maybe that’s a clue. Okay, so I wouldn’t name-and-shame them. That much I can admit. But let’s suppose we were at a high school reunion. Next year will be 20 years for me (can it really have been that long?). Would I voluntarily go up to these people who were unnecessarily cruel and start up a conversation with them? Could I do it? Yes. Would I do it? Probably not. That’s how I would rationalize it to myself. If I’m honest with myself, that’s how I think I would behave. I wouldn’t go out of my way to introduce myself to them, and I might actually go out of my way to avoid them. Even though people change, the impression they made on me was so negative that my conscious mind can’t suppress the resentment lodged in my subconscious mind. I would have to force myself to do it. And you know what? It would probably not be as bad as I think it would be. But my natural introversion coupled with the strongly negative emotional experiences would most likely cause me to be antisocial towards people who were previously mean to me. It turns out I do hold grudges. I’m not proud of it, but it’s the truth. I’m not sure if anyone here was paying attention but a couple of weeks ago we witnessed one of the biggest shockers in modern Canadian politics – the province of Alberta elected the (traditionally) left-of-center NDP party to a majority government. Alberta is the most conservative province in Canada and reliably votes conservative at the provincial and federal level. To put this in perspective, imagine if the state of Texas voted Democrat in the next 2016. It’s that unthinkable. I took a look at the election results. While I was as surprised as anyone to see the NDP win in Alberta, their win is not so clear cut. Because Canada is a parliamentary democracy, the party that wins the most seats forms the government. And, you can win the most seats – over half – without winning more than half of the popular vote. You can do this because if you have pockets of support localized in a few regions but not much elsewhere, you can win overwhelmingly in those few regions but lose by a few percentage points everywhere else. It’s like winning Game 1 of the Stanley Cup Finals by 8 goals but losing the next four in overtime. The NDP won 54 seats with 40% of the vote. The Conservative party (the previously ruling party) dropped to 10 seats with 28% of the vote. The Wildrose Alliance Party is the Official Opposition with 21 seats but fewer popular votes than the Conservatives, at only 25%. The always-weak Liberal party took one seat Calgary with 4% of the vote. I looked up the platform of the Wildrose Alliance Party and they are basically the Reform party but at a federal level. The Reform party was a far-right party based in western Canada, originating in Alberta, that for some reason thought they would be popular in eastern Canada and believed they had a realistic chance of forming government (they didn’t). When they finally figured out the rest of Canada – where the required votes are – wouldn’t vote for them, they re-merged with the federal Conservative party and eventually helped to form government in 2006 after moderating their positions. However, their spirit lives on in the Wildrose party. If you combine the Wildrose Party’s vote with the Alberta Conservative’s vote, they take 53% of the total vote compared to the NDP’s 40%. The right-wing party’s votes are interchangeable, that is, the a Wildrose voter might vote Conservative if there are no other alternatives, but a NDP voter will never vote Conservative or Wildrose. Thus, the combined sum of the popular vote of right wing parties in Alberta is still greater than the NDP’s. It seems that vote-splitting hurt both parties in 2015 the way it did the Reform and Conservative parties at the federal level in 1993, 1997, and 2000. Here, the combined power of the right-wing parties is 78%. And comparing it to 2015, you can see most of the NDP’s +30% comes at the expense of the Conservatives (-16%) and Wildrose Party (-9%) and a bit of the Liberals (-6%). The Wildrose holds onto their seats in rural Alberta in 2015 but the city of Calgary (not shown above) goes mostly NDP (after being mostly Conservative) and Edmonton went completely NDP (after being mostly Conservative but more Liberal and NDP than its southern neighbor). Interpretation: southern Alberta is more far right than northern Alberta, and the cities are a closer battleground where people switching sides really hurts. Liberal voters also decided to back the winning horse (the NDP) in 2015. The Conservative party has about the same number of seats with about 8% more of the popular vote. You can see that they’ve pretty much hit their limits in terms of seat count, 60 vs 61. Once you get to 40% of the popular vote you’re on track to win a majority because the rest of the field splits. The real story here is the provincial Liberal party having a strong showing during this election and then collapsing in 2012. 2004 was another cakewalk for the Conservatives even though they won the same number of seats but less popular votes than the next election. And that’s why 2015 is so surprising – the Conservatives dominated provincial politics for so long and they lost to a left-wing party that never got more than 10% of the popular vote. But if the NDP and Liberal votes are interchangeable, the Liberal/NDPs got 30% in 2004, 35% in 2008, 20% in 2012, and 44% in 2015. The left-of-center were never insignificant (except in 2012 when a bunch voted Conservative to keep the Wildrose party out), they just needed a few voters to swing away towards their side and ally behind either the Liberals or NDP. This year, they picked the NDP. I didn’t think that Alberta had swing voters. Yet a 10% overall swing from right-of-center to left-of-center was enough to propel the NDP to a victory. They had to eliminate the Liberals, the right-wing parties had to split the votes, and the voter dissatisfaction with the ruling party prompted change. And now Alberta has gone orange. Yet their reign on power is tenuous. Right-wing parties are still stronger overall with their combined vote. If the 10% swing NDP voters ever go back to the Conservatives, or the Wildrose party figures out that they are not appealing to the majority of Albertans and merges with the Conservatives like the Reform party did, the NDP will be gone. There just isn’t enough left-wing votes to overcome the combined forces of the political right in the province. And that’s my analysis of the earthquake in Alberta. For a long time, we’ve been threatening the cat with a shave. 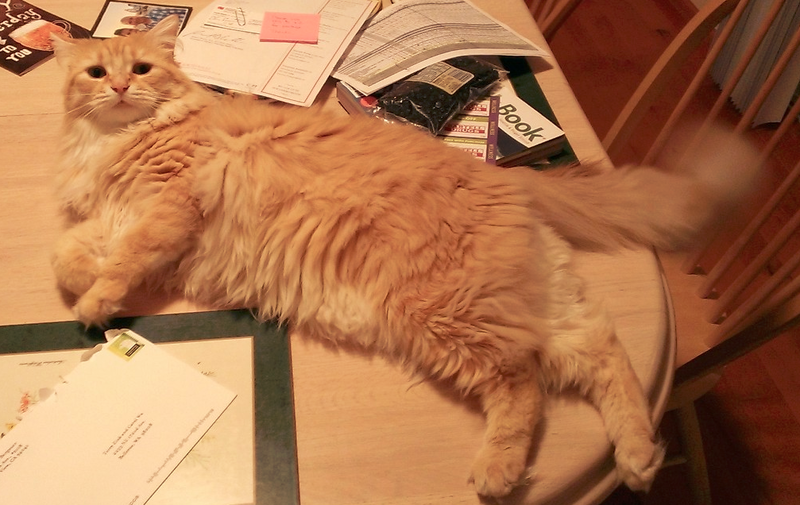 For you see, the cat is a long-haired cat. For the most part she keeps herself pretty clean but she sheds a lot. She also sometimes gets stuff stuck on her backside by her posterior and then either the wife or I have to cut it off with a pair of scissors. The cat struggles so much when we do that frequently both of us have to do it – one to hold her and one to cut her fur because every time we do she squirms. We called a pet groomer who is known as the Cat Whisperer. 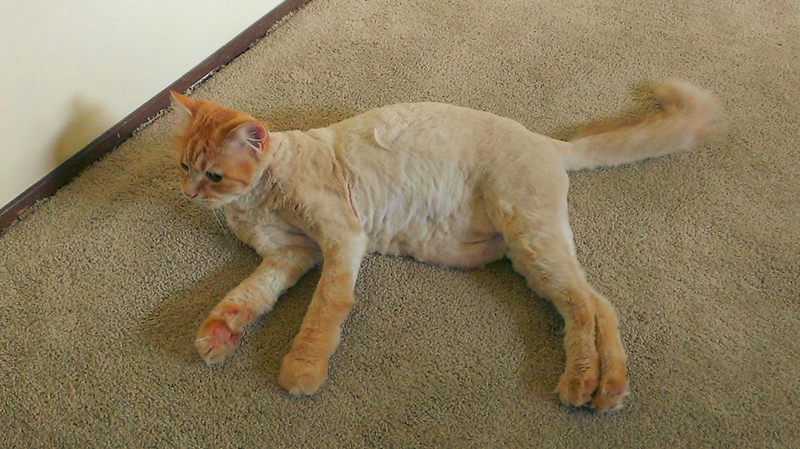 We said “Can you trim our cat?” and they said yes. So last week, the guy showed up and asked for the cat. He was a nice guy, from Colombia. I gave him Ruby and then went back inside because I had work to do. You may be thinking that trimming a cat’s fur would take about 10 minutes and then he’d be done. But no. It took about an hour and 15 minutes and while I was inside getting some work done, I could hear the razor in his van. But when he was done, the results were in. Believe it or not, that’s the same cat. I thought that she would spend the rest of the day hiding somewhere, but she didn’t. She was back to normal within about 15 minutes of being brought back inside the house. Her fur has grown out a bit since then but she doesn’t shed anymore. She also hasn’t gotten any stuff on her posterior, either. So, it seems to be working out. It had better, it cost $125. Last month, April 2015, the wife and I went to Sedona Arizona. Sedona is a couple of hours north of Phoenix, in the geographic area of the US called the Colorado Plateau. This is an uplifted part of the country also referred to as the Four Corners and it’s basically a desert. There are some trees and plants but it’s quite harsh. For several centuries, it was inhabited by native Americans and the region we went to was inhabited by many different groups of people, the latest of which were the Navajo people (I think). Now, what’s cool about this picture that the guide is pointing at is that we know how many cultures painted on this wall and it’s not just one – it’s six! Six over a period of not just a few hundred years, but nearly 10,000 years! 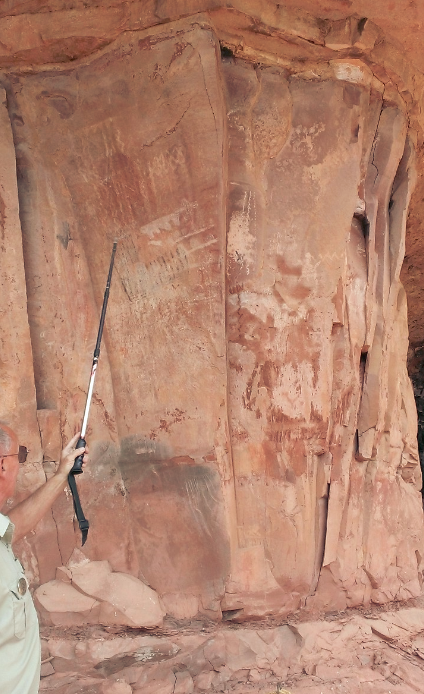 Right where the guide’s stick is pointing is a series of vertical scratches, just up and left of the animal thing (the scratches are faint but are in white). I can’t remember exactly what he said, but either the scratches were made by mammoth tusks or the scratches were made by people who were contemporary with mammoths, hunting them! That means they go back to some of the first human residents of the Americas about 10,000 years ago. Subsequent areas around the wall were made by additional civilizations who inhabited the area meaning that it was a pretty good place to hang out all those years ago as people moved in and out, in and out. And, they left their graffiti for us to admire hundreds of years later. 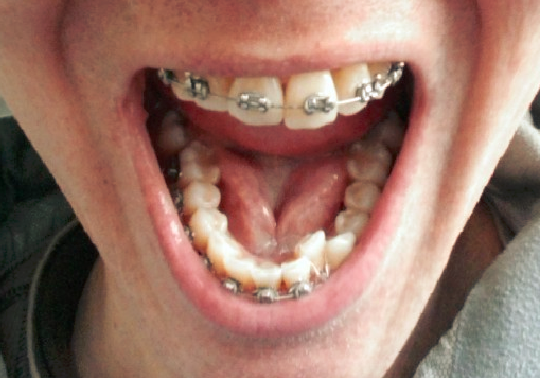 Long time readers of this blog will know that last June I got braces put on my teeth. 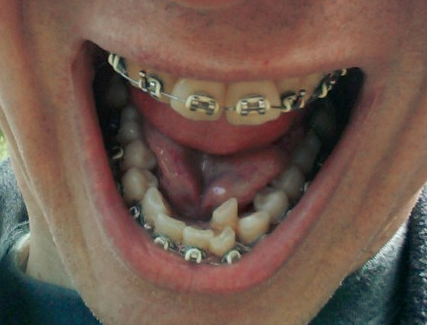 I did this because I had known for years I should do it, and I noticed that my teeth were getting worse. 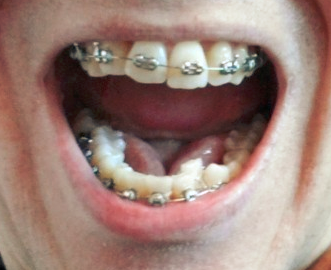 I got braces put on to correct the problem. 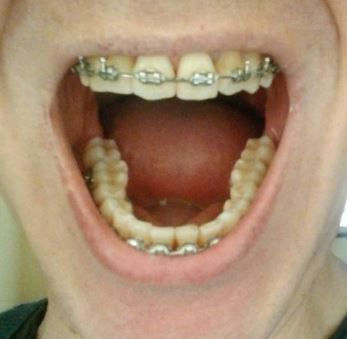 Below is a timeline of how my top and bottom ones have improved during the past 10 months. The angles and lighting aren’t identical in each picture but you can still tell what’s going on. 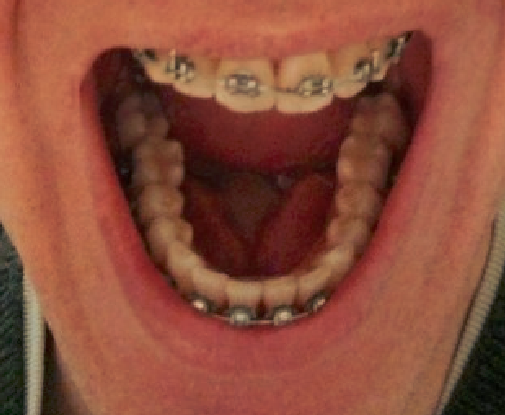 My teeth are straighter but they are also not the same size. I’m not sure if they are going to fix that. 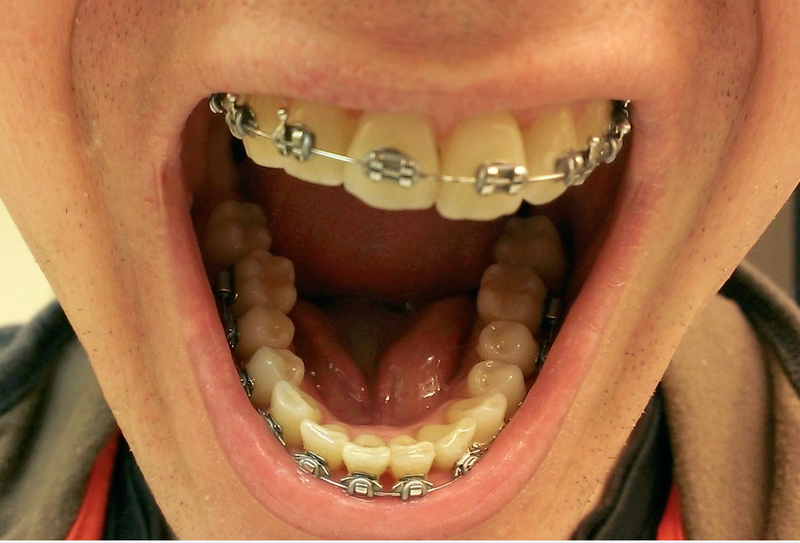 From the pictures above it is not noticeable other than the top tooth, but I notice when I look in the mirror. 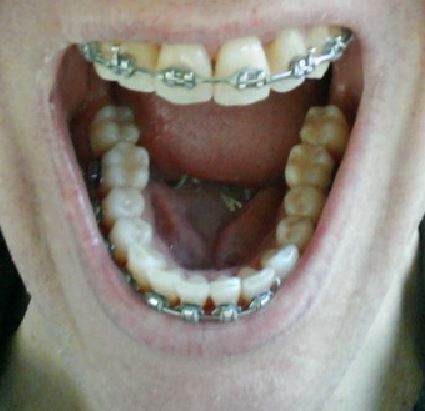 I only need to have my braces on for another 6-12 months.